Hard to believe we are already 2 weeks into 2019!! So I love the finer things in life, but nothing fascinates me more than experiencing new cultures. Definitely a bold move attempting to follow Bonnie Raitt in this timeless soul searching John Prine tune but I hope you like it and that my version does it justice. Let me know your feelings in the comments...! What can I say - a good song is a good song. Chatting with the bartender, Eden discovered he played percussion - just what she was looking for! Never mind that he was actually a heavy metal drummer, she asked if he'd be willing to join her for a performance she had the very next day. "I was so happy when he actually showed up!" says Eden. After 5 minutes of "backstage" parking lot rehearsal, Eden knew she'd found a "keeper". That 5 minute rehearsal has carried Eden & Mike through nearly 5 years of performing together whenever the opportunity allows. Eden says: "Mike's style of percussion playing has greatly influenced my sound today." It all started around 1970 when my sister got a guitar. I used to steal it from her room and try and play it. It wasn’t until a rodeo accident in 1984 laid me up for ten months. While recovering, I found that old guitar right where I left it, in my sister’s closet. That 8 month period was the true start of my learning how to play the guitar. That old guitar came to college with me, and it was there that I began to develop a love of playing music. The fiddle came into view around 1988 when I was raft guiding down in North Caroline. I remember driving up into “the hills”, deep in heart of Appalachia to listen to the locals jam. There was this old tobacco farmer who played the fiddle – stereotypical deep south local, overalls, tobacco-stained fingers and all. His fiddle playing just memorized me. This is where I gained an appreciation for the power of music to connect people. Fast forward to 2007 when I was running sound for the Cashmere Community Coffee House bluegrass shows. A pretty girl walked up to me and said; “I hear you play the fiddle, do you want to play in my band?” It doesn’t get much better than that. When not performing with Eden, or adventuring on his motorcycle or mountain bike... or galavanting the earth for the love of good backcountry skiing, John can be found in just about every bluegrass circle or band in or out of the area. O! And true to his name, he is the weather man at Stevens Pass Ski & Snowboard Resort. Being that music was always in my family and my father was in a band that got to open for the Grateful Dead, naturally my parents wanted to also give me the gift of music. Still no drums allowed, a few years later Aaron was introduced to musical theatre. With little to no fear of being on stage in front of people, he quickly became passionate about that and began singing Opera, securing lead roles in plays at the Washington Performing Arts Center & Dinner Theater in Seattle. It wasn’t until 7th grade, after rebelliously blowing one too many sour notes on the trumpet in band class that Aaron’s parents finally realized they could no longer fight his passion for drums. One year later Aaron was playing in an 8th grade talent show with his best friend Jeff on bass, performing Kiss’ “I want to Rock and Roll all Night and Party Everyday” - Ode to his future personality. After high school Aaron was awarded a full ride vocal scholarship to the Cornish School of the Arts in Seattle, but marching to the beat of his own drum, decided to instead adventure to Alaska and work dangerous jobs aboard commercial fishing boats. 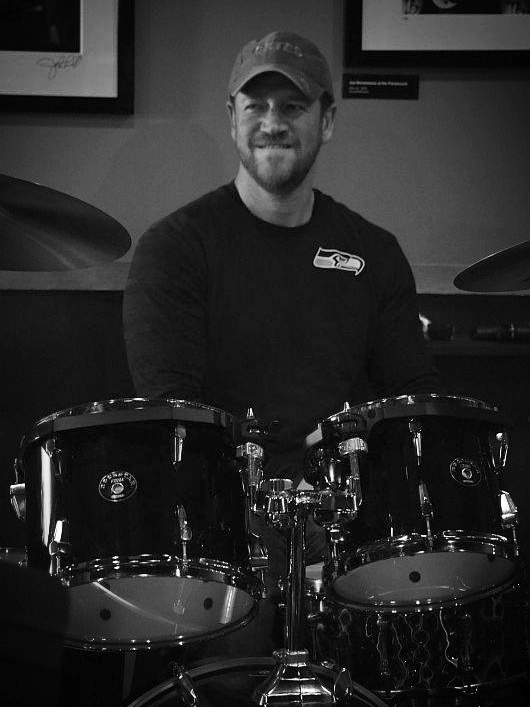 Eventually Aaron made his way back to the stage playing in and touring the Northwest with several Seattle bands, even opening for Dave Matthews and Tom Petty and playing several nightclubs consistently in the Seattle area before settling down to care for his family. After a long hiatus, Aaron has reconnected with his passion playing in several groups in his area. When offstage, he can be found making and selling fine craft beers for the Doghaus Brewery and entertaining visitors in the tasting room. He also enjoys all the outdoor activities that his city, Leavenworth, Washington, has to offer and spending time adventuring with his now teenage kids. Enjoy the parakeets on back-up vocals!